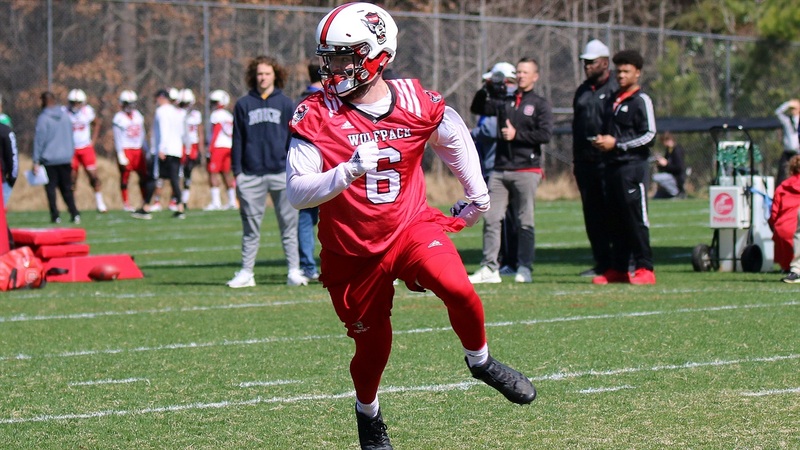 NC State redshirt junior tight end Cary Angeline has been on the move and dealing with turnover throughout his college career. He started out at Southern Cal but left the program a couple of games into his redshirt freshman season. Angeline ended up at NC State last fall and had to miss essentially the first month of the season due to NCAA rules before jumping into the mix. Dealing with various quarterbacks, offensive systems, and position coaches along the way, he is now hoping for consistency this spring. “It’s a lot different,” Angeline said. “Obviously I wasn’t here for last spring ball and now getting another year under my belt and being here for spring ball... it’s been good. “First of all, he’s in a lot more comfortable place,” NC State head coach Dave Doeren said of Angeline. “He was trying to learn a new system and meet new people, knowing he can’t play. It’s hard mentally. So there’s none of that uneasiness. Billed as a potential weapon in the passing game, Angeline understands that he has to continue improving all facets asked of him at the position. That’s perhaps the biggest change Angeline has had to deal with – a new position coach. Eddie Faulkner, who recruited Angeline to NC State, accepted the running backs coaching job with the Pittsburgh Steelers, a move that opened the door for Todd Goebbel to land the tight ends job at NC State. Angeline raved about his new position coach. What does Goebbel think of Angeline? New offensive coordinators Des Kitchings and George McDonald have taken over play-calling duties for the offense, and while Dave Doeren has been adamant that the Wolfpack offensive system won’t change, there will be some adjustments. NC State must replace Kelvin Harmon and Jakobi Meyers in the passing game which should lead to a potentially expanded role within the offense for Angeline. At this point he’s not concerned with targets... it’s more about doing whatever he’s asked to do.